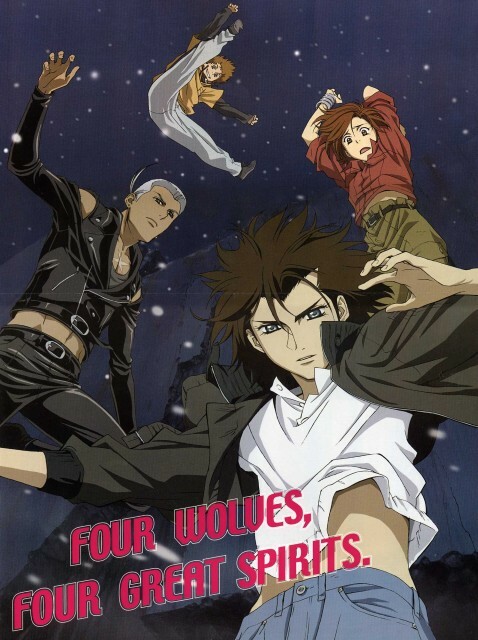 Mm, a nice angled shot of the four wolves in human form from Wolf's Rain. Scanned by me from a foldout poster in Newtype Japan; I've forgotten which month. Toboe's expression is especially priceless. @. @ Omg, finding Wolf Rain scans are sooo hard! Yeeee, great scan :3 Thaaank yoou! Those wolfs sure can jump! Love the scan, so hard to find anything with Wolf's Rain. Thanks! now this my friend is cool! Great scan, I've been looking for one like this for ages. I agree with you on the angle!! It's totally cool and I think it shows kind of their normal personalities and the side that's fun! Thank you for sharing it! Wow yet another great scan. Thanks a lot for providing it. Its hard to find good pictures for this series. Oh!!!! what a nice scan of all our favorite wolf's from Wolf's Rain!!!!!! Kiba looks really hot! And the others are great! especially Toboe! Loving every part of it! SUPER LINDA ESTA IMG. GRACIAS! Y NI HABLAR DE LO HOT QUE ES KIBA?! ahhhh, they're so cool in these pictures!thank you uploader!